Camp or Cruise in Old School style with updated comfort! Click Here for additional current photos. 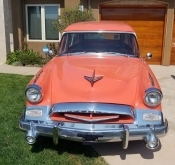 Studebaker, the only wagon company to convert to cars and be successful celebrated 100 years in business with the 1954 and 1955 Conestoga 2 door wagon. This Extremely rare model made only 2 years was bought new in Tucson, AZ and still has dealer plaque on tailgate. This is an Original Arizona Car. At some point it was sold, had an engine and transmission build with the Chevrolet 350 Engine in Arizona. It was sold to a serviceman in Indiana. There is an Air Force Base sticker in the window from Tucson dated 2004. This is a rust free vehicle. He put the car up for sale on Ebay in 2011. Here is a YouTube video of the car for sale in Indiana when it was purchased by owner #3 of Nevada. He subsequently moved to Tennessee where I purchased it. The car maintains its original chrome. New Front Bumper and Bumper Guards. Car is #98 off assembly line in 1955. It has new radial Wide White Wall tires with about 6600 miles on them. Functional fender spear turn signals, 4 way flasher, factory fog lamps which were offered on the President model. Click Here to view the photos I requesed in November 2017 from owner #3. The seats and headliner and door panels had been redone at sometime. Brand new Daytona Carpet with Dynamat and Heat shield. Owner #3 did some basic maintenance, wheel bearings, tires and air shocks but not much else. He added rare fog lights and drove the car locally. He owned the car for a several years and put on about 3,000 miles. He purchased a Packard Wagon and sold this car to me in November of 2017. I have rebuilt the car over the last 8 months. I had all the body work done with lead and have completed the following listed below. This car was taken to the Tacoma International Studebaker Meet in September with excellent performance. This page has been viewed 1443 times.